 Some described the plain, street-level plaza as bleak, brutal. Fans of Daniel Libeskind's master plan for Ground Zero, which originally called for the entire memorial site to be sunken, complained that "Reflecting Absence" violated the spirit of that design by raising the memorial site to ground level.  Some family members of 9/11 victims complained there was no access to the bedrock level on the footprints, the area where the Twin Towers had stood. 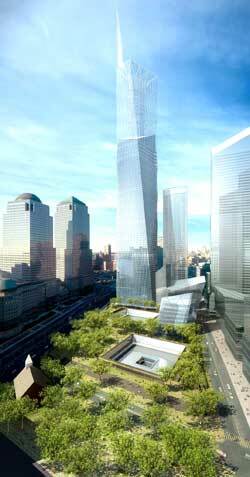  Many called for original artifacts from 9/11 to be incorporated into the design. Just wait, officials told all the critics, your concerns are being addressed. A week later, Michael Arad, the original designer, and landscape architect Peter Walker, had struggled to incorporate the requirements of countless clashing visions. Many believe they were able to pull it off. 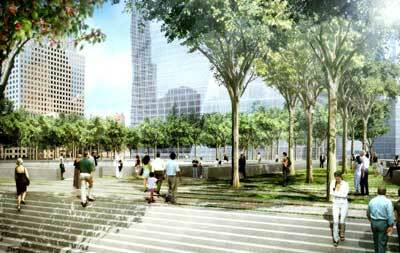  Arad and Walker livened up the plaza surrounding the pools by planting a "forest grove" on the site.  They incorporated access to almost the entire north footprint, and about half of the south footprint, all the way to the bedrock level.  The slurry wall, part of the 'bathtub' foundation of the original towers, is now accessible. These revisions did not end all criticism, but they did change the tone from one of negative skepticism to one of, if not satisfaction, hope for satisfaction. With a final memorial design now on display at the Winter Garden, many began to discuss what will happen next. Others continued to dwell on their specific controversies, while some even found new elements to debate. By placing artifacts on the site, Arad has addressed a widespread criticism of his original plan. But by putting them underground, he has also brought a new debate to the fore. Some now insist that these artifacts be presented at ground level, becoming a part of the primary memorial experience. Others have said that seeing the destroyed facade of the Twin Towers or a burnt fire truck, is too traumatic to be in plain site. Visitors, they say, should be able to choose whether or not to view these items. One particularly contentious issue, how the names of the victims will be ordered, was left unresolved in Reflecting Absence's original plan. Some asked for no distinctions to be made amongst the dead, but a number of uniformed rescue workers insisted that their colleagues who died on 9/11 be listed together, with an indication of their rank. Arad admitted that the ordering of the names was an especially difficult issue, saying that "every way that you find to do this satisfies some but causes pain and anguish to others." His solution was to list victims' names randomly while distinguishing rescue workers and firefighters by a helmet or similar symbol next to their name. The New York Post immediately reported that upon learning of this arrangement, some firefighters were still angry about this proposal. But even those who were left unsatisfied seemed upbeat after seeing the revisions. There have been few of the harsh denouncements that have become a standard part of any discussion about the memorial. Criticisms have been couched in optimism. "Although it's late in the process, we feel like it's a vital first step towards realizing a memorial that is not only going to provide remembrance, but also historical authenticity," said Anthony Gardner of the Coalition of 9/11 Families. "We do, however, feel that further modifications to this plan are necessary." This was a big shift for Gardner's group, which gave the original Reflecting Absence design a grade of 'F,' for not providing access to the bedrock level of the footprints. As late as last week, Gardner was threatening to push for a new memorial process. Arad himself caused some to change their tunes. The shy looking 34-year-old architect for the city's Housing Authority contrasts sharply with the better-known architects and public officials schooled in presenting their cases to the public. But while Arad's nervous, emotional mpresentation at the Federal Hall on January 14 gave away his inexperience, it also won him some fans. 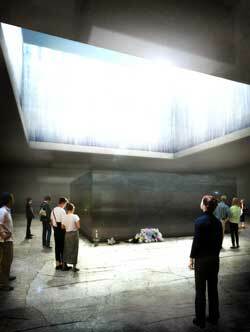 Arad met with family members of 9/11 victims the night before the revised design was shown to the public. Those who attended the meeting expressed confidence in him as genuine, and said that he seemed emotionally vested in the process. His personality convinced skeptics that their concerns would continued to be addressed. Inevitably, others felt left out in the cold. Arad's plan made larger changes to the Libeskind master plan than did any of the other eight finalist designs in the memorial competition. By bringing the plaza up to ground level, and by changing the cultural buildings that Libeskind originally envisioned on the memorial site, the memorial has created new problems, said members of civic groups who have long been involved in the design process. Now, the memorial will be too loud, too integrated with the street, too easy to use as a way to cut-through. "The whole Civic Alliance has a problem with how they've abandoned the Libeskind plan," said Beverly Willis, head of Rebuild Downtown Our Town, a group of Lower Manhattan residents, businesses, and professionals. By not adhering to the master plan, Willis worries that the development of Ground Zero risks being left rudderless. "Now that so many changes have been made to the plan, we'd like to see what the new plan is." For his part, Libeskind insisted that he has not been left by the wayside. He claimed that Reflecting Absence was his favorite of the eight memorial finalists, and that it was consistent with his original vision. The job of a master planner, said Libeskind, is the creation of a setting for the memorial, not the creation of the memorial itself. "What I was presented in the master plan was the largest possible canvass for the contestants to design a memorial," he said. "[Arad] chose to cut it fully to the bedrock at the footprints, but nowhere else. It's fine, it's a very interesting, very bold, simple interpretation of my idea." Now that the public has seen this design, there is the sense that the emotional peak of the process has been reached. Practical issues are beginning to get discussed. One the day of the presentation, one development official said that the memorial will cost over $350 million. Environmental control and traffic planning are right around the corner, said Councilmember Alan Gerson , whose district includes Ground Zero. While these issues may not pack the same emotional punch as the actual design, Gerson said that his constituents, who will be the memorial's neighbors, are already beginning to show concern. "We have to recognize that this is not the end of the process. The integration of this design, this concept, with the surrounding community is a critical phase which has to be informed by community input, democratic oversight, and recognition of all of these needs," he said. Victims' family members, who have invested themselves emotionally in the design process itself, are also shifting their focus. Monika Iken, who lost her husband Michael on 9/11, announced that she was starting a foundation to raise money for cultural events centering on the memorial site. Her initial goal is to raise $9.11 million by September 11, 2004, and to begin sponsoring events within months. Through this type of effort, Iken hopes to give those who lost loved ones on 9/11 an emotional outlet, until the memorial is actually built. "Now that this memorial is out, it's important to realize that families aren't going to have anything for years," she said. "We don't have anything now."